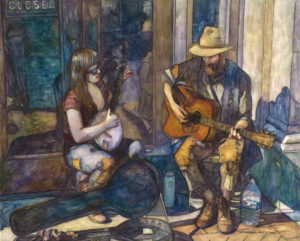 French Quarter Duet, an original painting by Lakehill Upper School Visual Arts Chair Scott Boles, was recently accepted for the 2018 National Art Education Association (NAEA) Member Exhibition. The event is in Virginia at the NAEA Studio & Gallery from Oct. 1 through January 4, 2019. The mixed-media painting Boles submitted is part of a series of more than 300 paintings of the French Quarter that he has created during the past 15 years. Boles has a long connection with New Orleans, as his wife Jane was born there and they visit several times each year. After Hurricane Katrina, he began donating a portion of his sales, raising more than $3000 to help build houses in the devastated Ninth Ward. “My paintings are a way to help a city that I know and love,” Boles said. Of the 386 submissions for the exhibit, only 62 were selected for gallery display by the panel of six arts leaders. Located minutes from Washington, D.C. in arts-rich Old Town Alexandria, Va., the NAEA Studio & Gallery showcases outstanding artwork created by visual arts education professionals, highlighting the artistic skill and vision of members worldwide. The organization invests in innovative initiatives to support instructional practice, research, and leadership in visual arts education. Lakehill Preparatory School offers an extensive visual and performing arts program, with more than 15 fine arts courses, taught by professional faculty who are all working artists in their respective disciplines. Find out more about Lakehill Preparatory School at lakehillprep.org.